Mid-Missouri colleges blaze the national esports trail. Years ago, it was football. It was basketball. It was baseball. It was the threat of any sport-related scholarship undermining academics for the sake of athletics. Connecting collegiate funding to sports bucked the historical education system. Today, those notions are long since buried, yet collegiate esports — electronic sports involving video game competition — have generated some newfound uncertainty, causing history to repeat itself. After personally leading the charge to adopt an esports team at Columbia College, complete with scholarship opportunities, Dalrymple wants to set the record straight. It is that kind of attitude and dedication to the sport that has helped secure national recognition for Columbia College’s esports team, evidenced by its top three spot in ESPN’s first-ever Top 25 College “League of Legends” rankings, released in mid-March. Not only that, but the school also hosts the largest annual gaming convention in the Midwest. But Columbia College is not the sole school in the region to embrace esports and allocate scholarship funding to such a program. 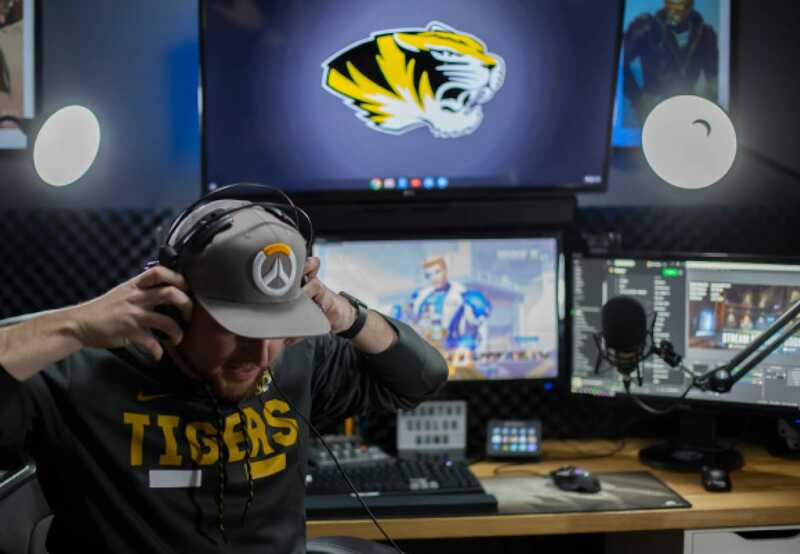 Both Stephens College and Maryville University also have their own teams, and the University of Missouri recently announced its plans to launch an esports program this fall. “The world has voted,” Dalrymple says. “esports is a thing.” A thing that multiple Missouri colleges have refused to ignore or incorrectly label as a passing fad. A thing that has drawn collegiate-level interest and funding. A thing that is causing universities across the country to offer esports players a league of their own. Walking inside Columbia College’s Game Hut is a step into another world. It’s dark, but lights hang from the ceiling to illuminate the computers lining the walls. Ferocious, yet strategic, clicking and typing echo throughout while a Han Solo carbonite statue stands guard over the room from one of the corners. Focused faces outlined by heavy-duty headsets are captivated by the video game “League of Legends,” although the term “video game” might not be adequate here. There is a serious competition happening in this facility. The hard work required of esports athletes and coaches includes the same basic practices that define all college-level athletic programs: recruiting, coaching, practicing, competing and even physical training. Columbia native Bob Hanson, a senior on Columbia College’s varsity esports team, and his teammate, Evan Lawson, a sophomore and transfer student-athlete, take turns describing their daily practices, which last around four to five hours each. A typical practice includes an administrative meeting, a team dinner, scrimmage blocks consisting of three games at one hour apiece and, finally, video footage reviews where coaches follow up by identifying and correcting any mistakes that might have occurred during those games. Teamwork is also essential when it comes to recruiting, Meininger says. “Many of our players know each other through the game, and it helps us to find new recruits,” he adds. Once the right recruits for the program are identified, Columbia College then offers scholarship packages of differing levels based on overall skill and previous achievements. Another essential component of collegiate esports is physical training, which is intended to promote not only healthy lifestyles but a thriving, teamwork-oriented atmosphere. On top of multiple workouts per week, Columbia College’s esports athletes host a special practice each Tuesday that is dedicated to playing another sport. Soccer, dodgeball, basketball and ultimate Frisbee are all frequently used to achieve this “off-screen” bonding. Not only has esports helped with Lawson’s communication skills; it has also allowed him to become a better, more relatable team player in the grand scheme of life. “It has helped me learn how to express how I feel,” he says, “but I also now understand how to find middle ground with others.” Both Lawson and Hanson are hopeful that their time at Columbia College will ultimately lead to careers in the esports field, citing opportunities in playing in professional or amateur leagues, as well as coaching. 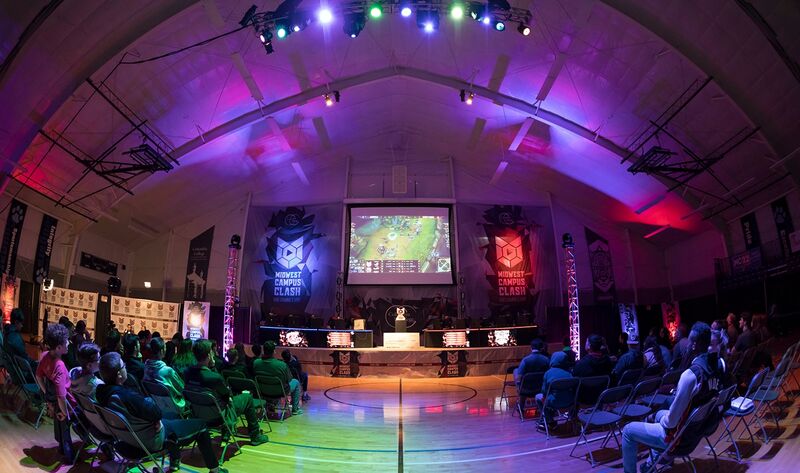 In the world of collegiate esports, Columbia College has made a name for itself. The team scored the top spot in ESPN’s recent “League of Legends” rankings and placed runner-up in the 2018 College “League of Legends” Championship in Los Angeles. This idea led to the creation of a video game tournament in which Dalrymple competed against one student in a game of Madden NFL, was defeated and, subsequently, was responsible for footing the bill for a one-year supply of textbooks and pizza. Case in point: Mizzou’s esports program launching in the fall. This decision will make MU one of the largest universities to adopt such a program and the first school in the Southeastern Conference to do so. From there, the esports tournament and expo event, Midwest Campus Clash and Gaming Expo, was born. The major headliner of this event is a fiercely competitive “League of Legends” tournament comprising eight collegiate esports teams. Screaming crowds and announcers surround a stage where players from several schools compete to take home portions of the tournament’s $25,000 grand prize pool, a hefty sum that will go toward the winning school’s future scholarship and equipment budgets. Columbia College pulls out all the stops for this event, completely transforming its basketball arena and embellishing it with vibrant lights and displays, a variety of vendors, virtual reality experiences, food trucks and, of course, an abundance of hands-on games. This year will include “Fortnite,” an oversized “Galaga” and a section dedicated to classic arcade games, encouraging participation from all age groups in attendance. With last year’s event drawing more than 2,000 people, expectations for the third annual event in April are high. “As far as we know, this is the biggest gaming event in the Midwest,” Dalrymple says. The home esports team has some expectations of its own for the event’s major tournament. Despite the losses of years past, Hanson is grateful for the opportunity the event provides. It has validated his decision to stay home and use his talents to represent Columbia College. “The amount of work that our school puts in to make this event happen just shows their level of dedication to making our team feel good about being here,” he says.